Back in March my dad and I embarked on an epic journey that began in Bangkok, Thailand. The trip started with a 10 hour bus ride to the Laos capital of Vientiane. The next day was spent walking around and visiting the sights of the city and enjoying the beautiful French architecture. We also stumbled upon the Lao National Stadium and I ran a lap of the track in my sandals! Then we were off to the town of Vang Vieng via a mini bus. The one thing that was an obvious difference between Thailand and Laos was the slow pace of life that exists in Laos. This was evident by the minivan ride from Vientiane to Vang Vieng. The ride was slow as it passed through small villages, around windy corners and up some steep hills. The ride took 3.5 hours to cover a distance of 150 km. We finally arrived in Vang Vieng, a town made famous by “tubing”. “Tubing” involves renting a tractor inner tube, getting a ride 5 km. out of town and then riding the inner tube down the river back to town. The next morning we brought along a good map of the town and surrounding area and went for a run through the town and into the countryside. We were attempting to get to a cave, but unfortunately the gate leading to the entrance was closed, so we were not able to enter. Our journey then continued with roller coaster minivan rides that lead us to the northern Laos city of Luang Prabang. In this city we toured some of the numerous temples and monasteries, took in a night market, walked around and of course went for a run. The next day got up early and went for a run along the Mekong River and through the town of Luang Prabang (which is a UNESCO world heritage site). We then returned to our guesthouse and prepared for another long day riding a minivan to the town of Phonsaven, Laos. We came to Phonsaven to visit the Plan of Jars, as our last stop in Laos. The next morning we headed off to Plain of Jars with a map in hand. We ran 8 km. to the Plain of Jars and walked around the Plain of Jars Site 1. One unnerving part of the trip was the fact that we had to be careful where we walked because not all of the site had been cleared of unexploded ordinance (UXO) from the Vietnam War. It was very evident that there was a war, as there was a man-made cave that was used for hiding during the war, bomb craters and some blown-up jars. After visiting the site we headed back ruuning into town (with a stop for some banana energy at a roadside stall). The next morning we boarded a bus at 6:00 am. bound for Vinh, Vietnam, 12 hours later we arrived! Then, we had to get another overnight bus headed to Hanoi, Vietnam. When we finally arrived in Hanoi, we were greeted to a metropolis jammed packed with millions of scooters. It was amazing to see all the things that the Vietnamese people were able to carry on scooters. I saw five people on one scooter; I also witnessed large plants, cartons or eggs, televisions and fans being carried. We spent the day visiting Ho Chih Minh Mausoleum and wondering around the old city. The next day was spent visiting some more sights in Hanoi including the Hoa Lo Prision, some temples including the impressive Temple of Liderature. I woke up early the next morning to go for a run around the old city and Hoan Kiem Lake. It was surprising how many people were up at 6:30 am. doing different exercises such as walking, running, bicycling, dancing, meditation, badminton, etc. After my run, we were off on a two day tour of Halong Bay (one of the 7 natural wonders of the world). When we arrived at Halong Bay we were greeted by an amazingly beautiful sight, even more so than the pictures that I had seen. We departed the port at the city of Halong and we were off on our clockwise loop of the bay. The day was spent visiting a cave, climbing to the top of an island viewpoint, swimming in the cold water and kayaking. The next day we visited a peal farm and then headed back to the port. Immediately when we got back to Hanoi we headed to the “open tour” bus pick-up point and we were off on the overnight sleeper bus to Hue. After a long overnight bus ride we arrived in Hue, Vietnam. Hue is a city rich in history, as it was the imperial capital of the Nguyen Dinesty between 1802 and 1945. We walked around the old part of the city and visited some of the palaces. I thought that this would be a great place for the a sprint race as I walked around the palaces and gardens. Maybe the next stop on the Park World Tour? The next morning I went for a run around town with a simple city map. I ran through the market (seen in picture), continued along the Perfurm River, along the city moat past some temples and then back to my guesthouse. Then it was time for a very quick shower before boarding a bus for Hoi An, Vietnam. Three hours later we arrived in Hoi An. We walked around the UNESCO World Heritage Site old town stopping at some old houses, museums and shops along the way. It was a short visit in the town, as we boarded yet another overnight bus bound for Nua Trang. We spent a day at the beach relaxing in Nua Trang and then that night we took our fifth overnight bus of the trip headed to our final destination- Ho Chich Minh City, also known as Saigon. When we arrived in the city we found a place to stay and then immediately booked a tour to the Cu Chi Tunnels. The tunnels are located about 50 km. north of Saigon and were used as hiding places for thousands of Vietnamese during the Vietnam War. It was a very interesting place to say the least and cool because you actually got to crawl in some of the tunnels. The next day and the final day of our trip we spent more time exploring the old part of Saigon. We did some shopping for some last minute souvenirs. Then that night it was time to fly back to the “big mango”…Bangkok. For those that don't know, 10mila is an overnight 10 man relay, and the most prestigious Swedish relay, with around 330 teams entered this year. GMOK, like most other Swedish clubs, had put in a lot of preparation ahead of the race. It is one of the year's biggest weekends in the orienteering world, and I was really looking forward to it again this year. Little did I know what was really in store for me. It was with excitement a week before the race when I found out I was chosen to run the 7th leg on the club's second team. A 7km day leg on a really solid team. But things changed a day before the race on the bus up to Stockholm. Coach Fredrik sat down next to me and asked if I could trade legs with Robert on the 4th leg, since he was feeling a bit uncertain after some sickness. I didn't hesitate too long before I came up with a response. I sat in my bus seat for the next hour pretending to sleep, but really having my head swirling with what laid ahead. My thoughts went back to highlights of previous years, what the guys said who ran the leg last year, and the exciting stories of Ottawa club member Stefan Bergström. It was all a drastic change from the short day leg that I was expecting to run. As nervous as I was, I knew that I was prepared to do it, and I knew that I wouldn't have been asked if the coaches didn't think so as well. I've felt in really good shape as of late, and I'd run quite well in recent night races and trainings. I managed to get a few hours sleep before we arrived at the arena at 11pm, an hour after the start. After scoping out the arena and drinking some much needed coffee, I got in a bit of a shortened warm-up and was into the change-over just after 1am. All three of my teammates ahead of me ran super well, and we were sitting in a better position than I thought we'd be. 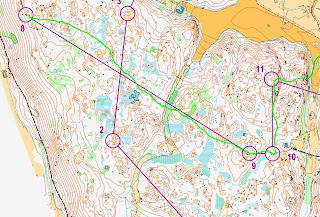 Mikael changed over to me in 34th, 15s behind a pack of 6, and 11minutes behind the leaders. The thing about Långa Natten this year is that it was unforked, meaning that it really paid to be in a good group. It was really important that I catch the group ahead, which included IFK Lidingö, one of the race favorites. I managed to catch up after the long run to the start triangle, but I had pushed too hard to do so. I don't remember a whole lot about the first leg, from trying to get settled into the pack and get the massive A2 map folded. 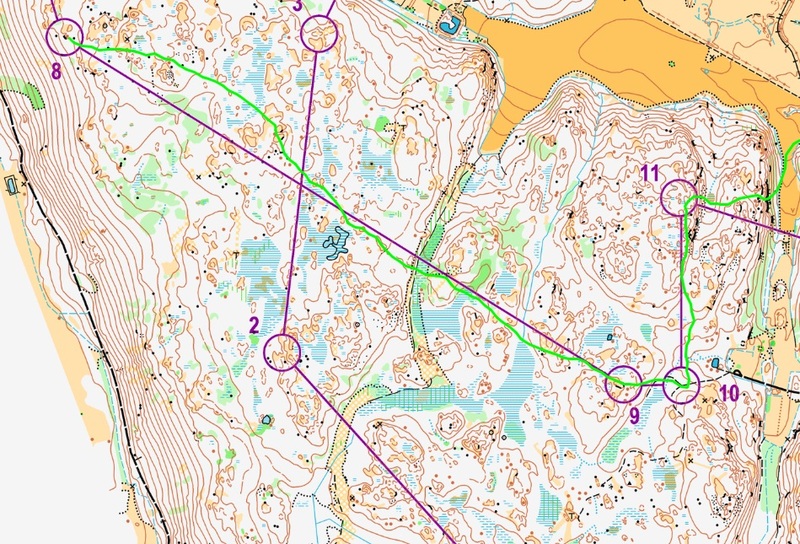 The pace was really high with Lidingö leading the group. To the 2nd and 3rd I was able to check things off, but I was mostly just trying to hang on at the back of the line of lights. We had managed to gain 20s on the leaders at the 3rd control at 4.7km, but then things got interesting on the long leg to the 4th. There wasn't a whole lot to read on to this control, and we ran straight on through the green areas. I started to get really tired here, and was struggling through the closely knit pines. I mostly remember just focusing on the light in front, as the ones ahead were already hidden past the next trees. One guy had already dropped off, and I wasn't sure how much longer I could last at this pace. "Just to this next control", I told myself. As I felt we were getting somewhat close I took a stumble and dropped my map behind me. In those five seconds it took me to regroup I had lost the lamp ahead in the thick forest. I was all of a sudden on my own with not much of a clue where we were. I pushed on to try and get a sight of the lights farther ahead, and as the forest opened up I could see them a bit off to my left. As the lamps started to get closer I arrived at a control, #48, control 5! As I had tried to recover after my fall they had punched 4 and I had followed their lights on to 5. What a horrible feeling! How could I make such a big mistake? Well, when you're not reading your map and trying to hang on for dear life in the middle of the night crazy things happen. The scariest feeling was suddenly being on my own during Långa Natten. As I trudged back up the hill a trailing pack of 7 runners passed me in the opposite direction. After five minutes lost I got back to #4, luckily with a runner from Tampereen Pyrintö. It was nice to have company on the long tough leg to 7, which we spiked. After a small mistake to 8, I was on my own again. The leg to 9 was another tough one, but I ran it quite well, if a little bit slower to be safe. 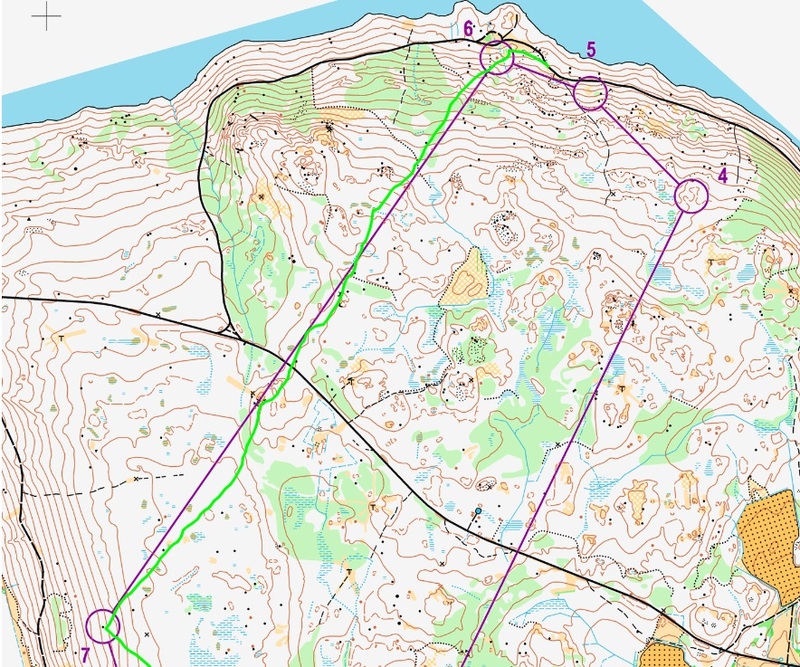 I ran the rest of the course alone, but with no mistakes, although the orienteering was simpler. It was really hard though to keep pushing hard on my own with tired legs. I changed over in 44th, losing 10 places, but most of them to top teams. I'm most frustrated by the big mistake to 4, and wondering if I could have kept on to a pack longer in the nicer woods and paths in the second half. A bit disappointed, but I got through the long tough course ok, without too much damage done. They call it the Long Night, but in retrospect, it didn't seem so long at all. 18km flew by, and before I knew it I was into the last few controls. As I was running along an open ridge into the second last control I could see the horizon brightening to my left. By the time I was heading to the showers and sauna it was fairly light out, and an hour or so later I was lying in the sun waiting on our next runners while trying to catch some z's. The rest of my team ran well, and were able to bring us back into the top 40 as the second best second team in 37th. Proud to be a part of that! So much time and effort goes into 10mila, and I'm amazed at how calm and organized the coaches and crew kept during the weekend. It is definitely not possible without them. A huge thanks to them! The weekend wasn't a great success for the club, with the men's first team having some really bad luck, losing a lot of time during Långa Natten due to a broken headlamp. But the positive club spirit remained on the bus ride home, knowing that these things tend to happen in the crazy tiomila night. 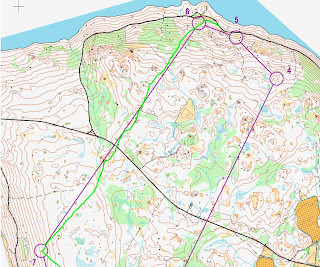 I hadn't really thought of it beforehand, but running Långa Natten was, in the back of my mind, a bucket list item. An experience I'll never forget. In case you hadn't realized, we are partway into National Orienteering Week (NOW). This great event was established in 2004, imagined by the Calgary orienteering club. Initially known as Orienteering Week in Canada, it became National Orienteering Week in 2008. From May 4-12 there are 21 exciting orienteering events put on in 17 locations across Canada. Being from Greater Vancouver Orienteering Club, I'm most excited about the McCartney Creek race being held in North Vancouver. I'm out of town on the 12th, but was privileged with the chance to run on the mostly completed map. The (completed) map that will be used this Sunday should be a real treat to run on. While this week is a chance to celebrate the growing number of orienteers, I would like to point out that numbers aren't everything. Smaller numbers means closer knit communities of dedicated orienteers. Go to events often enough and one quickly becomes part of the core group. The core group, glad to have more people out, are welcoming to those who orienteer occasionally. The sheer size of our great country means that orienteering clubs are isolated, interacting mostly at large events. Thus, the chance for socializing at the large events is extra special. I hope orienteering continues to gain popularity and grow in Canada. As it does, the attitudes and culture of clubs will change and grow. Most changes should benefit the sport, but the tightness of our current clubs will slowly loosen. If this is the case, we will look back with fond memories on the way things used to be. More importantly, go out and enjoy the sport here and NOW. There's sure to be an event near you!